How it’s NY: Gay Pride was invented in New York City. How it’s Irish: Brendan Fay, a self-professed New Yorker, is a sprite off the streets of Drogheda. He is Irish down to his boots and back up again. Honor Molloy considers Brendan Fay’s new film Taking a Chance on God, and reflects on Brendan’s many achievements. It was a momentous handful of days for Brendan Fay. Brendan wore another hat on Saturday evening, that of film director, when his documentary Taking A Chance On God had its New York premiere at the SVA theatre on W. 23rd Street. Brendan’s film, which was was produced by Ilene Cutler, is an hour-long look at the life and work of an unlikely hero of uncommon courage: John McNeill, a Jesuit priest, World War II veteran and a pioneering advocate for LGBT civil rights. Born in Buffalo, NY, McNeill—a burly, bearded unassuming Irish-American now in his 80s—spent time in a German prisoner of war camp as a teenage soldier. His experiences there led to his involvement in the anti-Viet Nam War protests of the 1960s, when he served as a counselor for conscientious objectors. His desire for justice and love of humanity found its central expression in the service of Gay rights. 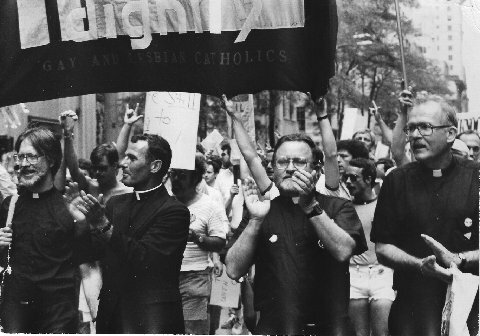 McNeill is the author of the groundbreaking theological study The Church and the Homosexual: Fourth Edition , the founder of the LGBT Catholic group Dignity/New York, and was a strong presence in the 80s Aids crisis. McNeill was a controversial figure, twice officially ordered by the Vatican to keep silent. His inability to ignore the promptings of his conscience led to his eventual expulsion from the priesthood. Brendan says the film was years in the making and was largely funded by many small donations. He describes it as the story of “McNeill’s love for his church, his Jesuit family, the LGBT Community and his beloved Charlie.” Charles Chiarelli is McNeill’s long-time companion. The SVA screening was packed with a friendly and enthusiastic audience. McNeill and Chiarelli were in attendance, as were a number of others who played important roles on and off the screen. The Hon. Noel Kilkenny, Irish Consul General in New York, and his wife Hanora came to the podium to offer their congratulations to Fay, Cutler and McNeill. A reception in the lobby followed the screening. Brendan deserves a bit of a rest at this point, but it seems unlikely. The Sprite of Scarlet Street, Drogheda is not one to rest on his laurels.